Design has one tip that works with both Apple and Android devises. Apple? Android? Why fight, come together in 2017. The All-In-One Retractable Charging Cable works on both Apple and Android phones, with a unique compact design, a 8 pin connector on one side and a Micro USB on the other. And the cord automatically retract in to the case, keeping cords neat and tangle free. 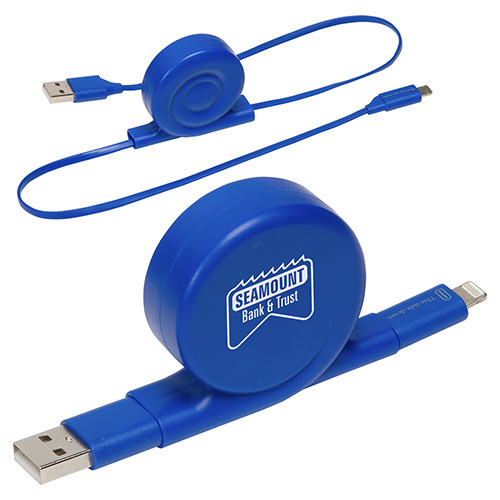 The All-In-One Retractable Charging Cable is a great tech audience, or really any audience, promotional gift, because it works with both of the most popular phone designs. You do not need to know if your client is Apple or Android, the cord is going to work either way. The cable extends to 23″ and there is a 1″ x 1″ one color imprint area on both sides of the All-In-One Retractable Charging Cable. Color options are black, blue, green, red, and white. Please contact us at info@proformagreen.com if you would like more information on – or samples of – the All-In-One Retractable Charging Cable.